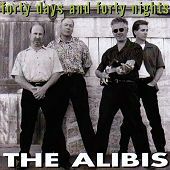 For the past two decades the four veterans that make up The Alibis have been playing in various bands and projects. Now, they're teaming up to create their own music. The outcome is a consistent album of developed pop songs that are built around great musicianship. "1968" is a tender piano ballad while "No Alibis" is a back porch rocker. "Good Life" is a smooth pop-rock number centered around a sharp guitar riff and steady rhythm section. "Hey Little Mama," on the other hand, is a groove-induced stomper. The band has the songs; they're developed, experienced, and have a good rhythm to them. Unfortunately, the vocals were too hard to get into. They seemed a bit forced and/or tired. Whereas the music was upbeat and filled with a driving tempo, even on the ballads, the vocals couldn't keep up with the bouncy state of the music. After consecutive listens they may grow on you, but it will take some time -- they won't just jump out at you. I'll give this album a C+. Alias: The Other Side of the Looking Glass Alice Dee Jay: Who Needs Guitars Anyway?